December is almost here which mean our Elf is coming back to visit. My kids have been busy getting the house ready for him and can hardly wait to see what he does. 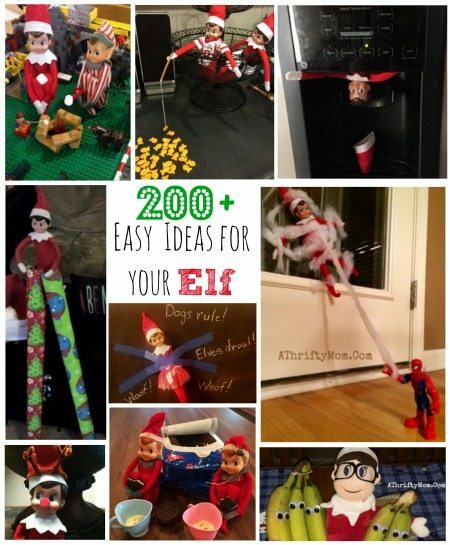 Here are well over 200 QUICK AND EASY ideas for your Elf On The Shelf. Many of these photos are from our own Elf, the others are ones our readers shared with us last year. Feel free to share your ideas in the comments below! Cleaning up the family room and pushing the vacuum around! Elf on the Shelf was helping himself so a little treat thanks to McDonalds. Under the Christmas Tree taking a bath in a bowl of marshmallows. Having a snack with the girls play kitchen food. at the top of the fire truck ladder, hanging an ornament on the Christmas Tree. standing on the fruit bowl, smelling the roses. Sitting in a doll chair looking at the kids with binoculars, and taking notes as to who was naughty and nice. Hanging upside down from the bathroom mirror with a long line of flower clips stuck to his hat. Found him inside a water bottle, and we found his magic trick of how he got inside. Zip lining into the Christmas tree with the cord from the mini blinds. Just hanging out on the lights waiting for the kids to find him. In our house plant, hiding with Sprout from Green Giant. In the dryer, folded the clean blankets into a little bed for him and a few friends. Eating chips and hiding in a Pringles Can Under the Tree! Snuck to Granny’s house for Christmas and was ridding her chicken They found him rocking in the baby swing with a few friends, holding an ornament for baby Madilyn since this is her first Christmas. Playing doctor with some of of my daughter LalaLoopsy dolls, one of them had a band-aid over her mouth. My daughter thinks it cause she talked a lot :). 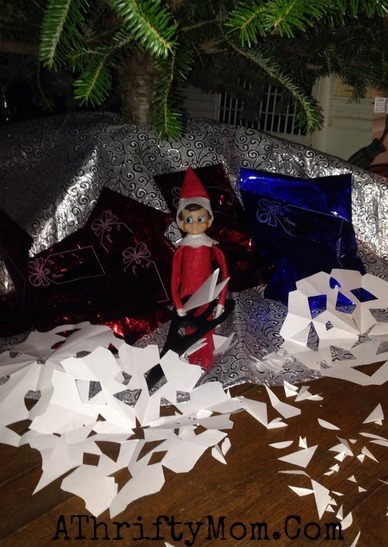 We found our Elf hiding in the advent calendar my 9 year old daughter made out of paper. Our Elf was a volunteer fireman last night and was getting training from Fireman Sam and Batman. My 4 year old was sure excited to see him in his fire station today. Hanging out in our big “B” watching over baby Jesus… the kids put a candy cane in the manger with baby Jesus they thought he might like a treat :). It took the kids while to find our Elf today… he was hiding on the shelf in a giant conch shell, it gave the kids a good giggle when they finally found him. The kids found our Elf hanging out on the bathroom vanity doors, they said he was in “Jail” for the day 🙂 He was putting up lights in the kitchen and looks like he got a little tangled up. Smuckers sent us a wonderful package of goodies for the Holidays, I guess our Elf could not wait to jump in and enjoy them. He was snacking on a spoonful of Jif peanut butter this morning. Look who dressed up like Elsa Doing acts o service and filling the manger with straw. 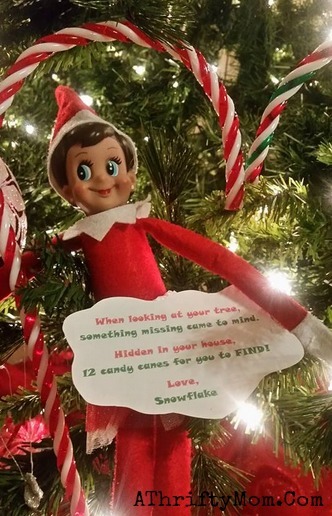 He was in the tree and wrote the kids a note to tell them to clean their rooms, and help Mom with the house. Day 18 ~ my 4 older kids are in LOVE with their new baby sister, Each morning they RUN down the stairs to find the Elf and then go grab their baby sister to show her were he is. I find it absolutely adorable…. I love moments like this. Pretty sure she has no clue what that little red thing is, but she sure loves to look at him with her family and giggle with delight as they share making memories together. Today he was peeking out a a roll of paper towels in the kitchen. Albie the Elf bought a project for the kids to make ~ Thanks Starr for this idea Little morning pick me up Elfie style ~ Thanks Magdalena for this idea Elfie just hanging out in the bathroom! ~Thanks Caroline for this idea We decorated our tree last night so the elves decided to decorate one to ~ Thanks Sherri for this idea Coloring a picture with a friend ~Thanks Kiley for this idea This is our elf laundry string. It snowed so he needed an extra pair of pants. In the note he thanked the kids for letting him join the family for the count down to Christmas then he reminds them he talks to Santa every night and to be good and try their best. ~ Thanks Cindi for the idea. Michele Lemanski Clark these are some cute ideas! Yeah I farted so what? This nightly post has saved me 3 time this year already! Thanks for the reminder! Awe thanks for the shout out!!! I like how Vader has back up, alone he could never take that Elf. Sarah Spencer You’ve got to do this one!!!! takes some dedication to get all of those footprints everywhere.. Nursing at 4am and realized I forgot to move mine too! THANK YOU!! He had to move today. My 2 year old had to go to the er today and was so good and brave. Of all the days….thanks for the reminder! So glad I saw this post, day 2 and I’m already forgetting to move him. Our elf is in a small toy sleigh being pulled by a team of Tow Maters.